Stu Cowan: Scouts listed to attend last night’s Canadiens-Panthers game: Los Angeles Kings (2), Chicago Blackhawks, Minnesota Wild, Dallas Stars, Vancouver Canucks, Tampa Bay Lightning, Florida Panthers, Buffalo Sabres, and Nashville Predators. Goldobin’s name hasn’t come up, but …. Elliotte Friedman of Sportsnet: Ottawa Senators GM Pierre Dorion may have may with Mark Stone‘s agency on Monday. The Edmonton Oilers would like to add a forward without giving up a major young piece for a rental. They’ve looked at New York Rangers Mats Zuccarello. The Rangers would likely want a prospect and second-round pick like they got for Michael Grabner. The Oilers would move their first-round pick. They are back and forth on Jesse Puljujarvi. Ryan Spooner is available. The Boston Bruins, Edmonton Oilers, Pittsburgh Penguins and Vancouver Canucks are among the teams interested in Carolina Hurricanes Micheal Ferland. Pittsburgh Penguins forward Derick Brassard is likely on the move. He wasn’t interested in the Winnipeg Jets last year. The Columbus Blue Jackets and San Jose Sharks make some sense. Pontus Aberg could be the next Anaheim Duck traded. Dallas Stars forward Brett Ritchie has been in the rumor mill and they may gauging interest in Valeri Nichushkin. The Florida Panthers may be open to moving defensemen Bogdan Kiselevich and Mark Pysyk. 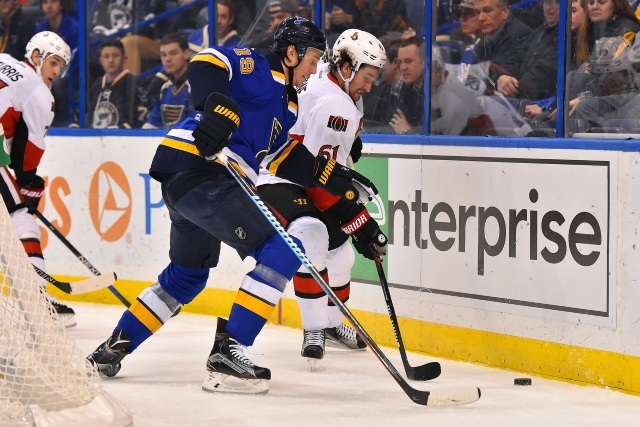 A few teams have been watching St. Louis Blue defenseman Jay Bouwmeester. Detroit Red Wings Nick Jensen could be a rental acquisition for someone. Contract talks will be happening soon for Jeff Skinner, Erik Karlsson and Artemi Panarin.